I expect this one to be short, but I’ve said that before. There are only two sections left, but I’m not going over the actual science section. I’d have to do a lot of fact-checking I don’t think either of us cares about and if you need to be told what a planet is you really shouldn’t be writing science fiction. Also, your teachers have a lot to answer for and I don’t just mean your science teacher. So this is the last section I’ll be reviewing, as we take a look at the ship’s computer. I’m oddly surprised that there is a section just to talk about the computer, but I guess they consider it rather important, even though it continues to be outdated with each new incarnation in the franchise. While other actors have performed a ship’s computer voice over the years, Trek fans will most likely consider Majel Barrett’s (later Majel Barrett-Roddenberry) voice as that of the computer. Except when a different voice was used for certain situations (like the mirror universe or a “guest” computer) it was Barrett in the original series, the animated series (although on occasion Nichelle Nichols pinch-hit for TAS), and all three of the 24th century series. Her last appearance before her passing was in the first Abrams reboot movie. The computer’s voice in the original and animated series was usually cold and mechanical, the only exceptions being the time they attempted to give it a more natural voice and when it malfunctioned. That first attempt at a less mechanical voice led to the computer flirting with Kirk, because he’s Captain Kirk and apparently his deal with the devil didn’t discriminate between organic and mechanical human. By the 24th-century they fixed the problem because you really didn’t want to hear the computer flirting with Picard. Besides, Beverly would be jealous. 🙂 So what was so special about the computer that the writer’s guide felt the need to give it a section of its own? Enterprise NCC-1701-D is controlled by the most sophisticated computer system ever installed in a starship; it has access to the entire library of recorded human knowledge can present any desired information almost instantly upon request. Now you’re going to give the thing an ego. Personally I don’t see why 1701’s computer is any better than on the other starships or shuttlecrafts. I guess that was harder to depict than a supergenius teenager. The next section goes on to say that any console can be used for any task, which makes me question the need for individual stations. If the science station can also be used for engineering it’s less like a specified station and more like a computer station at the public library. The computer speaks with a pleasant, non-emotional female voice. Intelligent and articulate conversations are possible with this computer–and it’s not uncommon to see a crewmember engaged in an interactive conversation with the computer, which can behave as if it is a fully sentient being. This isn’t that hard to believe considering chatbots exist on the internet and I’m sure people try to have conversations with Alexa or Cortana or even Google Assistant (who doesn’t get an actual name because Google’s more interested in branding). I even say “thank you” to GA sometimes and it responds “you’re welcome”. However, I’ve never seen that happen on the show. I’m guessing this one of those moments, and we’ve seen a few in this series, where ideas only exist to give the writer’s a sense of how the world or a character works even if it never makes it into the story. I’ve defended this in the past as long as you don’t overdo it. Give yourself room to come up with new ideas but having a starting point isn’t so bad. What’s the point of a dedicated science station if you can also use it to check the engines, look up a history lesson, or play Donkey Kong? The section after this talks about how the computer can follow you (insert “big brother/sister” joke here) if you have the communicator on, and arranges communications as necessary. It also keeps track of all the narration log entries, including the ones away teams make while they’re out. You know, “Commander’s log, supplemental: We’re currently in a doorless room with the walls closing in. My team keeps yelling at me to forget the log entry and do something.” Seriously, is The Orville going to make that joke at some point? They have to work with another ship in season two so if MacFarlane doesn’t want to make Mercer look bad just have the captain of the other ship constantly making log entries. 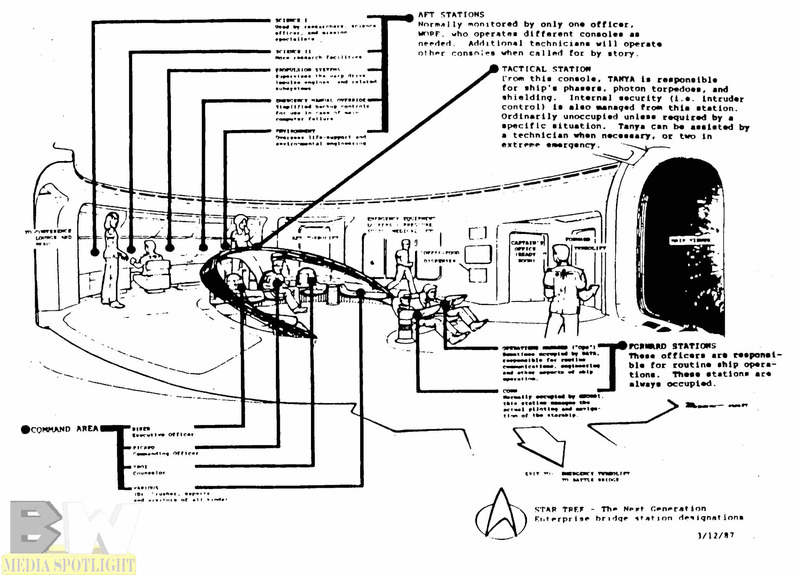 The final part talks about restricted access, restricted by recognizing the speaker’s voice as one who is allowed or not allow access to certain information like “where are the best places to hide a series of bombs” or “where is Riker planning to take the new yeoman to let her play with his trombone”. Of course, we’ve seen that any good impersonator could mess with that since Data once impersonated Picard to mess with the computer when he was under alien influence. No system is perfect…or you wouldn’t have a drama show. So if we’re done talking about (or to) the computer, does that mean this series is done? No, because next time it’s the final analysis of the guide versus what actually happened in the show. Since next week is Christmas week we’ll conclude this article series in two weeks. Posted by ShadowWing Tronix on December 14, 2018 in Star Trek: The Next Story Bible and tagged computer, Star Trek: The Next Generation.